The policeman stood in the middle of Arsenal Street, the main road through Watertown, Massachusetts, and screamed at any vehicle that didn’t belong to some arm of law enforcement or the emergency services: “Turn round! You need to get turned round!” Either side of him in the 1am dark sped, flashed and wailed a procession of emergency vehicles of a variety and quantity that, even in a career where I’ve covered a reasonable amount of terrorism and other trouble, I had never before seen. A little up the road, I now know, Tamerlan Tsarnaev, one of the presumed bombers of the Boston Marathon, already lay dead. 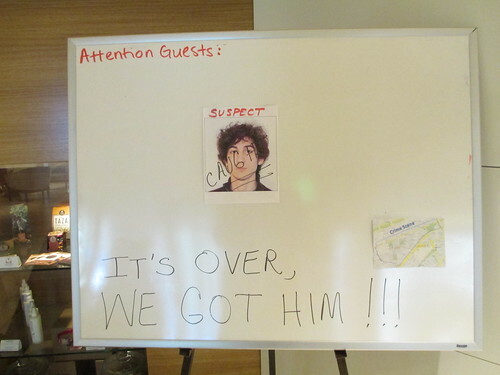 Somewhere else in the nearby suburban streets, Dzhokhar Tsarnaev, his brother, was hiding, trying to evade the arrest that would come around 18 hours later. And my attention, for at least a few seconds, was focused on a bicycle. It was one of the themes of the week I spent in the Boston area, starting a week ago last Monday, covering the aftermath of the bombings at the annual marathon, that I often found myself staring longingly at bicycles. I missed my wife and children very much. I was moved at some of the expressions of shock and grief I encountered. But the sight of people on bicycles provided a persistent, nagging reminder of what I was missing about my everyday life. Those people, for that moment, could experience the uncomplicated feeling of freedom that so often comes from riding on a bicycle – and I couldn’t. The whole episode started, however, with an unusually frantic bike ride – from my office in Manhattan across the Brooklyn Bridge home to Brooklyn, to pick up my laptop, a change of clothes and washbag. 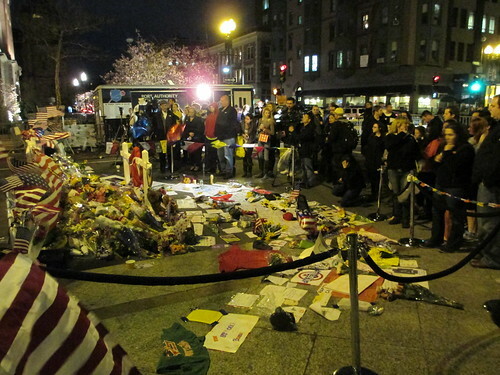 A little over two hours before, two bombs had gone off near the finish line for the Boston marathon. My bosses wanted someone to get up there and, after some discussion, it was decided the person would be I. I pedalled as fast a I could in the warm early evening sunshine, fretting all the while about whether I would have enough time to get back to Pennsylvania Station for my train. Then, having transferred a few notebooks, a rain jacket and some other essentials out of my pannier bags into my overnight case, I headed out for the subway station – and into what turned out to be a week of that sad state known as bikelessness. I didn’t, of course, worry too much about my transit status in my initial panic as I rode north. 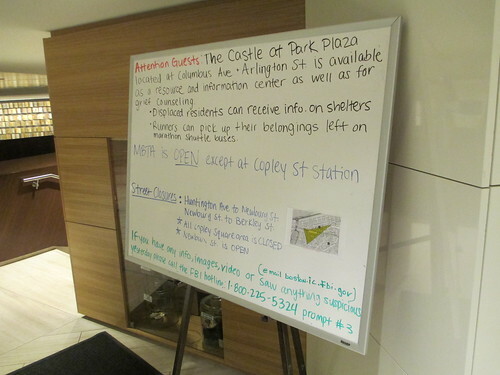 I had been to Boston only once before, in 1999, and would, I knew, have to find a way to file some kind of story about the scene there immediately after I arrived at midnight. I scoured maps to work out where I’d be arriving and where the bombs had gone off. I arrived in a city still festooned with signs and portable toilets put out for the marathon. The discarded runners’ heat sheets, the heavy police and national guard presence and the chaotic pile of wheelchairs outside a medical tent testified to the chaos in which the event had ended. Even as I took in the scene for my first piece, however, I found my gaze wandering. Two cyclists stopped at the junction of Arlington and Boylston streets to look in the darkness towards where the bombs had gone off. “Fixed wheel,” I thought to myself. “I wonder if they’re more popular in Boston than in New York.” They pedalled slowly off, their lights pin pricks in the darkness. I took a taxi to a distant, expensive hotel, filed a short piece about the scene, had a few hours’ sleep and woke up again, launching myself into several frantic days of rushing around the city on the tail of the latest overheated rumour about what was going on. I got about a lot over the next couple of days by public transport. In my tired and over-emotional state, I felt a particular pang about not being able to discuss Boston’s subway – the T – with my late father, who worked on metros all his life. He would, it occurred to me, have enjoyed discussing the vagaries of the US’s oldest subway. I took the T on Wednesday to Boston’s federal court house, as a crowd gathered outside on false reports that two arrested suspects were about to arrive there. I had spotted by this time the Hubway bikeshare station outside my new, downtown hotel. But it seemed a stretch to use it to reach Thursday’s post-bombing Service of Healing. I had no idea where the vast police cordon around Holy Cross Cathedral designed to protect the visiting President Obama would spread. So I walked that and many other trips over the week – peering at the cyclists, trying to work out how their journeys to work compared with mine, what the cyclists were making of the events in the city and whether Boston’s drivers were any more friendly to bikes than New York’s. I looked out, too, for Boston’s most celebrated cycle blogger – Bikeyface – but saw no-one who looked like a pen-and-ink drawing and gave up. I reported on the service – inwardly noting how many fellow reporters, struggling with their feelings much as I was, were wiping something out of their eyes. Some even joined in the applause and standing ovation for the president. I prepared to write a long, considered piece for the weekend about the bombings’ impact on Boston. I made a mental note that, as interest in the attacks waned, some time over the next couple of days I would get out one of those Hubway bikes and take it for an explore of the city. It wasn’t to work out like that. On Thursday evening, as I worked on my long, considered piece, an email from a colleague alerted me to an apparent disturbance over the Charles River on the campus of the Massachusetts Institute of Technology. Exhausted and preoccupied with the piece I was trying to write, I nevertheless caught a taxi to a site that turned out to be swarming with police. I started writing a story on my BlackBerry and talking to a news editor in Hong Kong. Then, seeing scores of police vehicles speeding away from MIT, I caught another taxi, with a French TV reporter, to Watertown, where I encountered the screaming, panicky policeman. Yet, amid that chaos, the detail that caught my eye was the Hubway bike. Somehow, amid the chaos and confusion of one of Boston’s most extraordinary nights, a fellow reporter had responded to the injunction to get out to Watertown as fast as he could by hiring a Hubway bike and pedalling more than five miles by the Charles River out to this suddenly world-famous patch of suburbia. I felt an instant sense of fellowship with the person involved – I recalled how I had cycled across London to get to the site of the 2005 Edgware Road bombing during the July 7 attacks on London. I respected, too, his extraordinary bravery – scores of screaming emergency vehicles must have made even worse road-fellows than the worst New York City-area drivers. Then, before I could make my fellow reporter’s acquaintance, my mobile ‘phone died. I was forced to hail an arriving reporter’s taxi back into central Boston. I recognised, nevertheless, the sense of community I’d felt on spotting another cyclist and sought it out again. 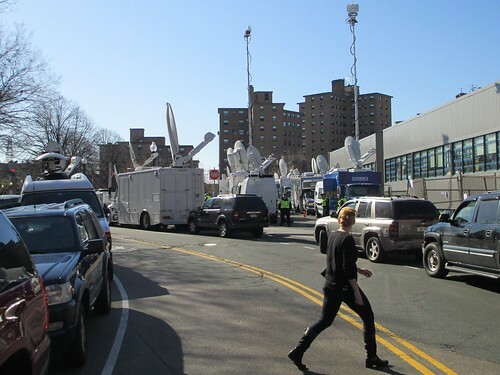 I chatted amiably on Friday to two young reporters who had cycled to Watertown’s media staging area as we awaited news of the eventually successful hunt for Dzhokhar. I looked over the shoulder of a photographer who had reached near the site of his eventual arrest by bike and grabbed unusually good pictures. On Saturday, seeking out the opinion of people in Cambridge, Massachusetts, at having had two terrorists living in their midst, I went up to a woman practising in a park riding in clipless shoes. I felt an instant sense of warmth for each of these people – a knowledge that each of us knew the pleasure of getting about under one’s own power, the joy of speeding down a hill, the satisfaction of climbing one. Those moments of fellowship did a great deal to keep me going until the point last Sunday afternoon when I was finally able to return to Back Bay Station and put myself aboard a fast train bound for New York City. That journey inevitably began a long unwinding process. I took the Monday off work, catching up with undone tasks and giving my bike an overdue degrease, clean and lubricate. A cycling neighbour chatted amiably as I worked at the task in our building’s back yard. Come Tuesday morning, however, it came time to return to normal. Having dashed about for a week covering one of the world’s biggest news stories, I was back to the unforgiving schedule of writing up company results. The change of pace under such circumstances can be as wearing as the process of covering the big story itself. But, for the first time in more than a week, I was swinging my leg over my Brooks saddle, pushing down on my pedals and rolling off onto New York City’s streets. There was a steady drizzle in the air and a blustery wind. It was far from an ideal day for cycling. A week away from it, however, had made me realise that this activity made me feel at home, regardless of where I undertook it. I was only a little way into my first ride to work after moving into my apartment in Brooklyn when I started to get into a terrible tangle. Trying to get down Kane Street, in Cobble Hill, I found the road marked closed. After heading past the road cones, I found it was a proper road closure, not the kind where one just wheels the bike on the sidewalk past the obstruction. The closure was absurd, I muttered to myself, as the one-way system pushed my route further and further from the one I’d planned. It was, I reasoned, probably some piece of stupidity on the part of the police, worried about being sued over an unlikely accident near some relatively innocuous building work. I calmed down considerably, however, after finding out via Google why the street was closed. On July 26, while I had been back in Europe, lightning had struck Christ Church, the Episcopal church at the junction of Clinton Street and Kane Street. 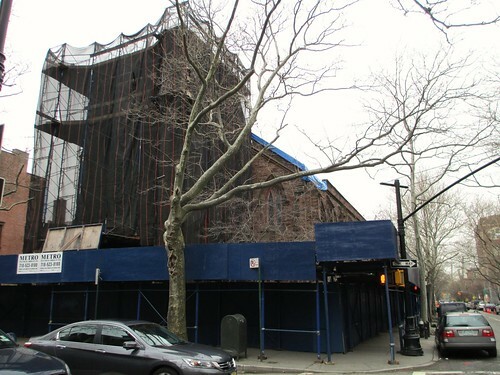 The spectacular tower – and scaffolding around it – had come crashing down as Richard Schwartz, a pedestrian, was walking underneath. The falling scaffolding had killed him. The building was a serious danger – and hadn’t yet been made safe. The incident helped to crystallise an idea that had been slopping in fluid form around my mind for a while. I’d never have been irritated about the Kane St closure, I realised, if I’d had better information in the first place. It was, it occurred to me, one of many instances where confusion arises because two different parties – the New York City Department of Transportation and myself, in the Kane Street case – have different understandings of what’s going on on a road. The asymmetric information sharing had at least left me only inwardly irritated, however. The more I thought about it, the more I realised there were times when such information asymmetry probably killed people. I encountered one potentially serious example the other morning while riding to work. I waited at traffic lights by the start of the Tillary Street segregated bike lane near the Brooklyn Bridge. When the lights changed, I moved off, only to find turning across my path a car heading in the other direction that should have been yielding to me. The driver’s behaviour was entirely wrong, based on his failure to understand what I knew - that the bike lane was as much part of the traffic flow at the intersection as the roads he was using. But, as he moved across my path, he leant out of his window. “Green light!” he yelled at me, self-righteously. Cycle lanes can give rise to information asymmetry as well. As I approached my office one morning last month, a truck driver opened his door in my path as I made my way up the side of some stalled traffic. He didn’t need to look for cyclists on that side of W54th street, he argued, because there was a bike lane painted down the other. Because of our asymmetric understanding of cyclists’ road rights, he had understood the cycle lane – which I knew to be a refuge for cyclists that didn’t stop me from using the rest of the road – as a kind of prison, to which cyclists should be confined. Perhaps the most striking and persistent problem of information asymmetry that I’ve come across, however, was in London, where I lived until last August. Most traffic lights at busy intersections in London feature an “advanced stop line” for cyclists – an area where cyclists are meant to wait ahead of the other traffic for the lights to change. Many cyclists value advance stop lines as an idea, since they should, in theory, allow cyclists to get away after lights change, get clipped back into their pedals and get back into a suitable line on the road before the motor traffic catches up. Few motorists, however, seem to have much idea either about the principles of the advanced stop areas or when they should stay out of them. At least one motorist informed me, indignantly, when I complained about his occupying the area that when he’d arrived there had been no cyclists waiting, so he’d simply driven into the bike area. Advance stop lines were involved in all three of the worst confrontations I had with motorists in London. In one case, a motorist deliberately drove very close to me and then very dangerously overtook me after I remonstrated with him about his driving into the ASL area as I was using it. A bus driver assaulted me (abandoning a bus full of passengers to do so) after I photographed his occupying the ASL area at a particularly dangerous junction. I had to call the police to stave off a threatened assault from another motorist to whom I’d complained about his driving into the ASL area. Leaving aside the more eye-catching incidents, ASLs were a daily source of tension and frustration. I’d often squeeze past a line of stationary traffic to reach what was meant to be a haven for cyclists – only to fill it full of motorists grumpy at one’s presumption in seeking to get a jump on them at the lights. It’s reasonable, I think, to assume that even a fairly modest publicity campaign might have let at least a little of the fresh air of information into the foetid atmosphere of confrontation surrounding ASLs. In New York, it surely wouldn’t take much of a campaign to educate drivers about the role of bike lanes and the dangers of passing bikes too close to improve driving standards at least a little bit. The New York cycling map, after all, features excellent advice for cyclists on how motorists should give cyclists at least three feet's clearance when passing. It isn’t, after all, a neutral thing to encourage new cyclists onto a city’s streets and then not tell motorists how to behave around them. Nature seems to abhor an information vacuum just as much as a literal one. In the absence of the pure oxygen of accurate, well-founded information, the information vacuum fills up with the carbon-monoxide-laden air of motorists’ assumptions about cyclists’ rights and responsibilities. It’s perhaps hardly surprising, given that no-one’s telling them otherwise, that so many motorists assume cyclists who ride well outside the door zone away from cars are acting maliciously, rather than entirely sensibly. 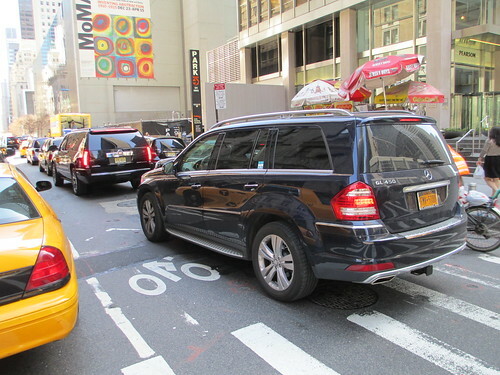 In New York, it’s still less surprising given how many bike lanes – including most of those I use every day – are painted in precisely the part of the road – next to the parked cars’ doors – that cyclists know to be the most dangerous. Park right across one of New York City's busiest bike lanes? Until someone says you shouldn't, you probably will. 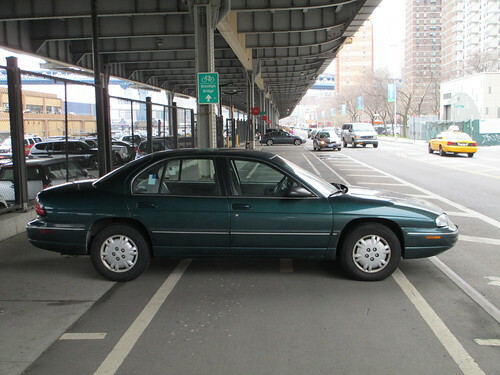 It’s hardly surprising, given the New York Police Department’s reluctance to enforce a wide swathe of road rules, that few motorists seem even to understand the harm they cause when double-parking in bike lanes or refusing to yield to a cyclist in a bike lane. Nor, in London, is it terribly surprising that ASL infringements continue at the rate they do when even the Metropolitan Police department charged with processing complaints against motorists from cyclists (normally backed by helmet camera evidence) is currently pleading with leading London cycle bloggers to tell people to send in no more pictures of ASL infringements. They say, to all intents and purposes, they’ve no interest in prosecuting them. The police’s attitude reflects, in an understated way, the strangeness of the political discourse around cycling. Politicians are eager, when announcing new policies between elections, to borrow cycling’s mantle of greenness and modernity and to encourage its growth. Closer to election time, meanwhile, many seem to revert to a different type – to claiming, like one minister I met, that cyclists were“their own worst enemies” or claiming like Boris Johnson, London’s mayor, that “typical” cyclists had skinny legs and ran red lights. No politician engaged in this delicate dance between pro and anti-cycling positions is likely to back a public information campaign explaining to frustrated motorists why, yes, that cyclist who yelled at you about your dangerous driving actually had an excellent point. However, until such information is made more widely available and police across the industrialised world are backing up the politicians’ line with proper enforcement, few people will experience the relief I felt at letting go of my frustration over the Kane St closure. Relief is certainly not the emotion that comes naturally to me each morning as I ride along the now-reopened Clinton St towards the Brooklyn Bridge. I am all too often forced into the narrow bike lane, in danger from car doors, as motorists seek to push past me. But, as I reach the Kane St intersection and see Christ Church, still wrecked but now made safe, I still recall at least a little bit of that feeling.